An all-around champion has strong malware-fighting abilities packaged with worthwhile extras. The big friendly “You Are Protected” green checkmark on Avast Security Pro’s home screen is certainly a plausible statement. The software is a rare breath of fresh air in a sea of anti-virus products that haven’t worked hard enough to keep up to date with current threats, or haven’t updated the interface to meet modern expectations of presentation and usability. Avast is danged good at catching malware. 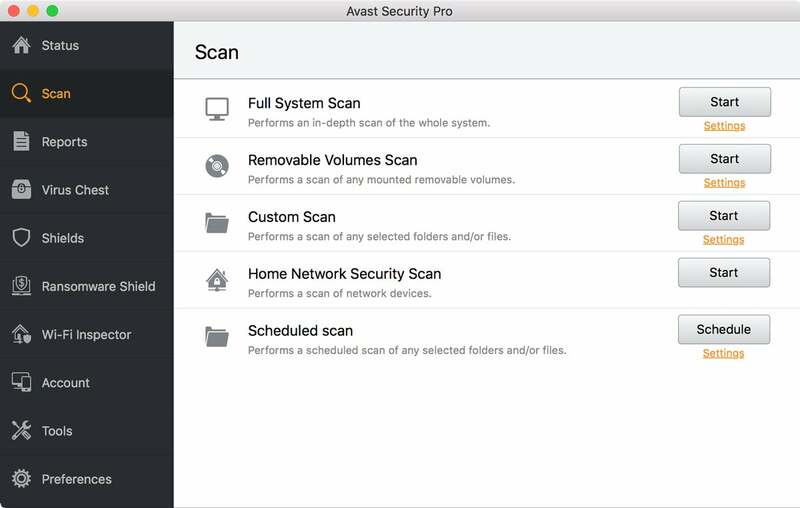 AV Comparables says Avast detected 99.9 percent of macOS malware and 100 percent of Windows malware. In spot testing, the app did splendidly. Immediately on decompression of macOS malware from an encrypted archive, Avast detected it, deleted it, and notified me. It did as well with malicious files on the web, though it didn’t detect some items at the WICAR test site that require active local components to be dangerous. Siccing it on drives loaded with other anti-virus products, Avast found test malware I’d downloaded that had wound up in cached files that the anti-virus software on those volumes missed. Avast blocks a malicious page from loading. 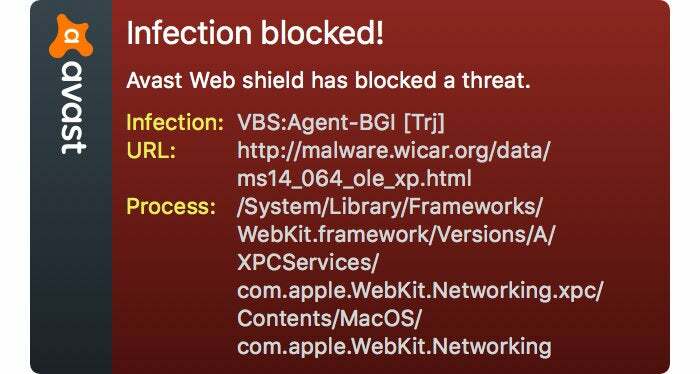 Avast’s browser component, Web Shield, doesn’t seem to rely on plug-ins (there are none to configure), but uses the program’s kernel extension to check at a low level. It can be managed from the Avast app, and settings apply to all browsers. If you’re interested in ransomware monitoring, you need to buy the Pro version ($59.99 for one year/one Mac; $69.99 for one year/three Macs; $99.99 for one year/10 Macs), which relies on folder-based ransomware monitoring. It marks the user Documents and Pictures folders as protected by default, and you can add more folders. 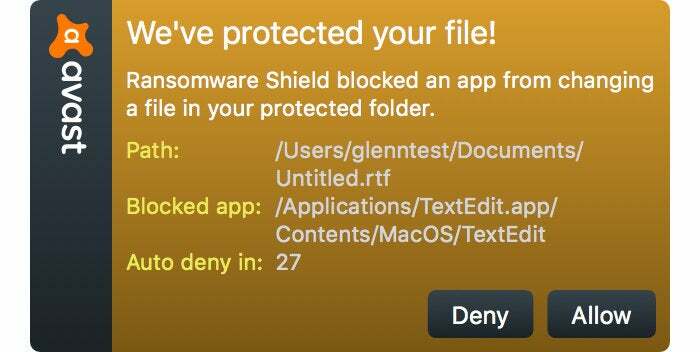 By default, Avast allows any Apple and App Store apps to manipulate items in those folders, although you can disable those options. Any other app that tries to modify or delete anything in the shielded folders is blocked, giving you an option to whitelist it. By restricting specific folders from having files modified by any but approved apps, Avast can reduce the potential for any ransomware attack. Here, it blocks TextEdit, which hasn’t been whitelisted. Outside of core anti-virus features, the Pro version also offers a Wi-Fi Inspector. This is unique among anti-virus software we tested, and it looks for devices on a network engaged in malicious behavior. Other anti-virus software packaged with network monitors either whitelist local network activity, or treat it the same as any malicious Internet attacks. This seems aimed at helping users understand if they’ve joined a network, such as at a coffeeshop, that has compromised or attacking devices on it. A unique Wi-Fi scanning option could be useful for those joining lots of unfamiliar networks. One negative is the soft but distinct upsell of Avast, which is sensible in its Free version, but not necessarily in a Pro. A Tools item on the lefthand navigation bar mostly displays other available products, like VPN service. A one-time message at installation might be acceptable, but mingling features and items for sale is too heavy-handed in a security product. While you can create an account at Avast Software, it’s optional. Once created, you can use it to add machines to log in from the software for a computer to join the account. Unfortunately, the account provides no remote mangement or configuration, just reporting. Avast offers a number of different options for real-time, scheduled, and on-demand scanning. If you’re looking for a free anti-virus program, Avast is the best choice, edging out Sophos by providing more parity between free and paid version. While we gave Sophos Home Premium and Avast Security Pro the same 4.5 mice rating, Sophos has a slight edge. The combination of active ransomware scanning makes it somewhat more superior to the folder-based method in Avast, while central configuration and remote control in Sophos can help for a disparate set of family or small-business users. 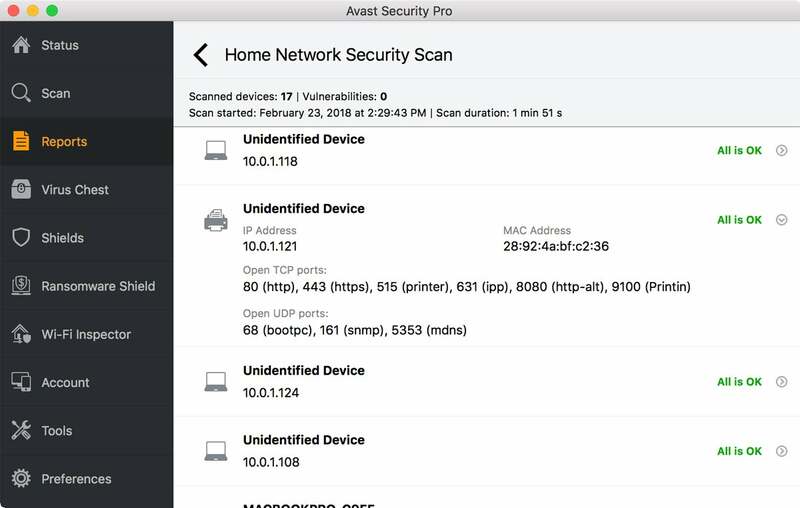 We like Avast’s unique Wi-Fi threat detection, and its native app interface, where Sophos leans heavily on the cloud.